Paul McGinn has won a contract with St Mirren, following in the footsteps of brothers Stephen and John. The 17-year-old John joined the Paisley club in the summer, two years after big brother Stephen headed for Watford after coming through Buddies ranks. Now 21-year-old midfielder Paul has signed for Buddies until the end of the season after leaving Queen's Park. He had spent three seasons with the Third Division club but left after attracting top-flight interest. Two of the Buddies' Scottish Premier League rivals - Aberdeen and Dundee United - were linked with McGinn. However, he has signed for St Mirren after a successful trial. 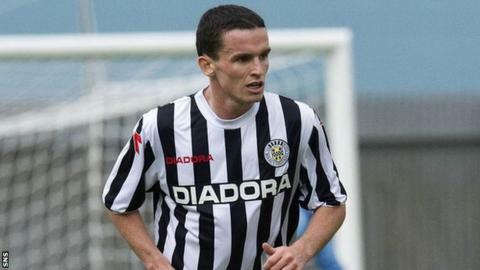 The signing of McGinn follows manager Danny Lennon's decision not to offer a contract to former St Mirren midfielder Franco Miranda, who had been on trial. Lennon explained last week, after signing former Bolton Wanderers 19-year-old Graeme MacGregor, that he had decided to go down the route of giving youth a chance. "We could have signed Franco Miranda, but by the time he was fully fit, it would have been almost Christmas before we could have got the best out of him, so he is now away back home," the St Mirren manager told his club website. "We made a conscious decision to bring in a few kids, including Graeme MacGregor, who is showing some signs of very good potential. "Investing in youth is the kind of club that we are, so I used the money there and hopefully that will come to fruition, but only time will tell. "Graeme shows great energy, handles the ball well, has good character and he has fitted in well which is very important. "He was in the Bolton youth system, where he had that wee knock back of rejection, but he has bounced back well and he has been given a wonderful opportunity here, which I'm sure he'll grab with both hands."